During the 1960s, consumer products focused on increased convenience with improved portability. As more women entered the workforce, time-saving household devices became a desirable addition to the home. Advertising campaigns and television commercials encouraged a liberated lifestyle free from the drudgery of housework. From 1960 to 1970, the rate of household appliance ownership increased significantly, with the number of homes having washers, dryers and freezers rising from 11 percent to 28 percent. First introduced in 1949, the side-by-side refrigerator reached its peak of popularity in the mid-1960s. Equipped with improved technology and frost-free capabilities, it featured a convenient design that allowed access to both refrigerated and frozen foods without having to bend down. Refrigerators of the era sold for around $500 and were a fashionable addition to American households. The suburban home of the 1960s often included built-in appliances that blended seamlessly into Formica kitchen countertops and wood cabinetry. Colorful built-in electric cooktops, single and double ovens, ranges, vent hoods and even refrigerator-freezers were incorporated into kitchen designs. Consumers could choose between gas and electric ovens. 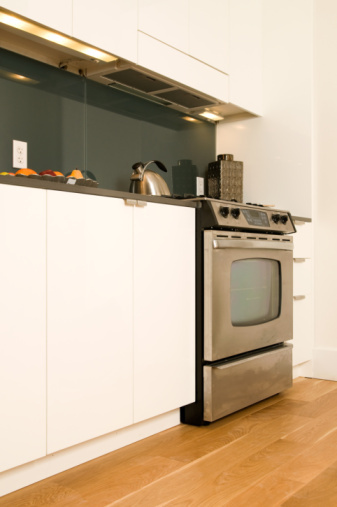 In 1963, General Electric introduced the first self-cleaning oven. As mass-produced goods became cheaper and easier to obtain, the portability of popular devices became a selling point. The portable dishwasher that required no plumbing or wiring was incorporated into kitchens. It came with a hose attachment to hook up to a faucet. How Does Radiation Work in a Refrigerator?